Rashuan Agee from Bogan led the All-Tournament Team for the 58th Annual Proviso West Holiday Tournament. Agee shattered the tournament record, formerly held by Farragut’s Michael Wright, with 71 rebounds (17.7 per game) for the 2018 tournament. He finished up the tournament averaging 19.3 points and 17.7 rebounds per game along with 2.75 assists, 2.25 blocks and 1.25 steals. (Box Score) Rashaun Agee dropped in 11 points and pulled down a game-high 21 rebounds to lead the Bogan Bengals (13-1) to the 2018 Proviso West Holiday Tournament Championship over the Whitney Young Dolphins (11-5), 74-65 on Saturday night. Agee added three blocks and four assists in the winning effort to earn Tournament MVP honors. After a Justin Warren lay in put the Dolphins ahead 51-46 with 1:45 remaining in the third quarter, the Bengals used a 7-0 run to close out the period, capped by a Jayvon Clark three to pull ahead 53-51 heading to the fourth. Bogan continued to add to its lead in the fourth, extending the lead to nine, 64-55, when Clark buried a three with 4:12 to play. Whitney Young tried to climb back, cutting the lead down to five, 64-59, when DJ Steward pulled up on the break with 3:22 to play. Bogan again answered, using a 8-2 run capped by a Jordan Booker layup with 1:38 to play to open their largest lead of the night, 72-61, and never looked back. Steward finished with a game-high 28 points on 9-for-20 shooting in the losing effort. For the Bengals, Jordan Booker scored a team-high 18 points to lead four in double-figures. Darrion Jones came off the bench to score 17 points while Jeremiah Washington added 13. For Agee, the 11-point, 21-rebound effort was his fourth double-double of the tournament, averaging 19.3 points and 17.8 rebounds per game while shooting .600 from the field. (Box Score) The Leo Lions (12-3) outlasted the Fenwick Friars (8-6) in the third-place game of the 2018 Proviso West Holiday Tournament, 78-72, on Saturday evening. Leo’s Dachaun Anderson and Fenwick’s Bryce Hopkins traded baskets throughout the night with Hopkins pouring in a game-high 34 points on 13-for-19 shooting while Anderson finished the night with a team-high 30 points on 9-for-10 shooting to lead three Lions in double figures. With the game tied 36-36 at the half, Fenwick’s Lucas Kolovitz scored the first basket of the third quarter to give the Friars what would be their final lead of the evening, 38-36. Leo went on a 10-3 run to open a 46-41 lead midway through the third. The Friars kept trying to reel in the Lions pulling within one on a few occasions including narrowing a 66-60 lead down to 66-65 when Kolovitz buried a top-side three with 4:03 to play in the fourth quarter. Leo had an answer every time, using a quick 4-0 spurt to extend the lead back to five before closing out the game on an 8-6 run to keep the Friars at bay. Leo shot 57-percent in the winning effort. Fred Cleveland and Kevin Drumgoole joined Anderson in double-figures, dropping in 20 and ten points respectively. For Fenwick, Solomon Oraegbu added 20 points as Oraegbu and Hopkins combined for 54 points on 20-for-31 shooting from the field. The 6-5 Hopkins was a perfect 4-for-4 from three and finished the tournament with a 29.0 points per game average. 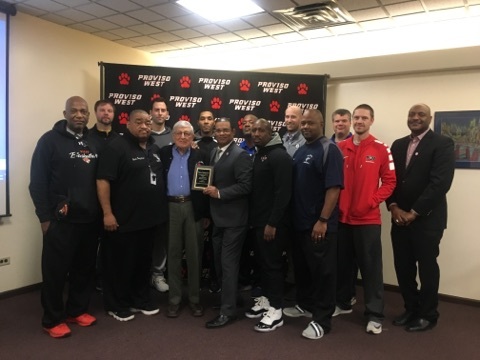 (Box Score) The final session of the 58th annual Proviso West Holiday Tournament began with the fifth-place game between Morton and Proviso East. The two schools battled through some adversity in the first half, but the Pirates of Proviso East finally pulled away down the stretch to win 64-51. Morton got out to a fast 5-0 start behind a three from Manny Rodriguez and a breakaway slam by Latik Murphy. By contrast, Proviso East misfired on six of its first seven shots but soon picked up the pace and incredibly scored the next (and final) 15 points of the quarter A couple of turnovers helped the Pirates’ run, and the Mustangs called timeout after falling behind 10-5. The timeout did not help Morton, however, as three missed shots, two missed free throws and three turnovers kept the Mustangs off the board for the rest of the quarter. The Pirates scored the first two points of the second quarter before Morton ended a drought of nearly nine minutes with two free throws. The Mustangs would get more points at the line, but it wasn’t until Murphy converted a three-point play at the 1:21 mark that they would have their first field goal in a 12:50 span. Despite the dry spell, though, Morton outscored Proviso East 10-9 in the quarter and trailed by only nine, 24-15 at the half. James Hobson had a nine-point half for the Pirates, but they shot just 10-32 (31 percent) for the half to the Mustangs’ 3-19 (16 percent). Both offenses hit the reset button to start the second half. Morton’s first shot of the half was a good three by Josiah Porter, but Proviso East countered with an 8-0 run, four different players scoring. The Pirates were unable to run away and hide, however. Murphy scored five points late in the quarter, and Morton was able to keep the game within 10 points, 41-31 heading to the fourth. The Mustangs were within six points in the fourth quarter before a 10-0 run by the Pirates finally put them in control. Keashon Fancher put back a missed shot, and the Pirates then knocked down six consecutive free throws, four by Terrance Thomas. Fancher provided a bookend to the run when he finished a fast break. Morton made a late run, getting the 16-point deficit down to seven, but Hobson’s three from the corner with 1:22 remaining sealed the deal for the Pirates. Proviso East (9-3) was led by Hobson’s 17 points, including 5-11 from three-point land; the senior guard also added five rebounds, three assists and five steals. Fancher tallied 13 points, followed by Thomas with 12 points and four assists, and Spencer with 10 points and four assists. For Morton (9-5), Murphy led all scorers with 25 points and also pulled down six rebounds. (Box Score) Larkin High School of Elgin and St. Joseph High School of Westchester squared off at the 58th annual Proviso West Holiday Tournament Saturday afternoon with the consolation championship at stake. The two sides battled through a tight contest for 32 minutes, with the game literally going down to the final second before a free throw won it for St. Joseph, 48-47. The teams came out of the first quarter with St. Joseph holding a 15-13 lead. Maliq Anderson scored six points, and the Chargers shot 7-12 (58 percent) while holding an 8-5 advantage on the glass. Larkin shot just 4-12 (33 percent), but three of their baskets came from behind the arc, with Jashon Johnson-Neals, Victor Perez Jr. and Marcus Green all making good. Both teams struggled to shoot the ball in the second quarter, although Larkin stayed close by hitting seven of eight free throws, and St. Joseph led 24-21 at the half. Three-pointers continued to keep Larkin in the game in the third quarter, despite St. Joseph shooting five of eight from the field. The Royals nailed four in the quarter, including three as part of a closing 9-0 run after Anderson’s trey have given St. Joseph a 36-28 lead. Johnson-Neals hit the bullseye on the first two, and Trace Boley’s three from the corner gave Larkin a 37-36 lead as the teams headed for the fourth quarter. The fame was tied entering the final 2:30 after Green’s three and 15-foot jumper. After both teams missed a couple of opportunities, St. Joseph’s Jon Robinson was fouled driving to the basket with 0.4 seconds left. Robinson missed the first and then had to wait through a timeout before he could shoot the second. Unfazed, Robinson’s second shot was nothing but net. However, the Chargers had to hold their breaths for a moment as an 80-foot desperation heave by Larkin caught the rim before bouncing away. Robinson‘s last free throw gave him 17 points to tie him for game-high scoring honors. Anderson had 11 points on 5-6 shooting while Kyle Thomas was a perfect 5-5 for 10 points; Thomas also pulled down seven rebounds and blocked three shots. St. Joseph (7-7) shot 21-40 (53 percent) for the game, 3-10 on threes and 2-6 on free throws. Larkin (6-11) was led by Johnson-Neals with 17 points (6-9 shooting, 3-3 threes) and six rebounds. Perez Jr. chipped in with 14 points. St. Joseph’s consolation title was their fourth in the 58-year history of the tournament. Under legendary coach Gene Pingatore, the Chargers also finished fourth in 2013, second in 2014 and fourth in 2015. (Box Score) Saturday’s second game at the 58th annual Proviso West Holiday Tournament pitted the host school Panthers against the Warriors of Crete-Monee High School. Both teams were looking to bounce back from 0-2 starts. Crete-Monee looked to have an easy victory in hand, building a huge lead after three quarters, but Proviso West made a ferocious comeback in the fourth. In the end, Crete-Monee stood its ground, surviving by a final score of 64-56. Crete-Monee opened up a 15-7 lead late in the opening quarter, taking advantage of ice-cold 3-16 shooting by Proviso West. The Panthers’ offense began to click early in the second quarter, and Kijuan Walker’s layup pulled the home team within 21-15. However, Crete-Monee answered with an 8-0 run sparked by Jamaari Bowen’s two buckets. They carried the momentum into the half with a 31-18 advantage, with Bowen already most of the way towards a double-double with 10 points and six rebounds. A 21-9 third quarter looked to move the Warriors into full blowout mode. Coy Hampton and Julian Dancy each scored eight points, and Bowen capped off the quarter with one of the highlight slam dunks of the tournament off an inbounds play. As with the first two quarters, the Panthers’ shooting hindered their efforts to stay with the Warriors. Despite staring up at a 25-point deficit, the Panthers did not close up shop early. They capitalized on some loose play by the Warriors (14 turnovers) and shot 9-23 after going 9-44 the first three quarters combined. Calvin Lucas led the charge with 14 points, as the Panthers sliced the gap to single digits at the 2:44 mark. Walker’s layup with 15 seconds left cut the Warriors’ lead to four points, but free throws by Hampton and Bowen allowed Crete-Monee to exhale and walk out of the gym with a victory. Bowen and Hampton recorded double-doubles for Crete-Monee (2-11), with Bowen scoring 17 and pulling down 11 rebounds, and Hampton putting up 12 points and 10 rebounds. Dancy scored 13 points, and Karriem Hamilton Jr. nearly made a third double-double with 12 points and eight rebounds. The Warriors shot 25-59 (42 percent) for the game and won the battle of the boards by a 49-38 margin. Proviso West (3-7) had just one player in double figures, Lucas scoring 20 on 4-11 from the field and 12-14 from the free-throw line. Omarion Coleman was off a double-double by just one point, as he recorded nine points and 10 rebounds. The Panthers shot 27 percent for the game on 18-67 (1-19 from threes) and 19-27 (70 percent) from the free-throw line. (Box Score) The final day of the 58th annual Proviso West Holiday Tournament began with two teams looking to claim their first win of the week. In the end, it was Niles West High School emerging victorious by a score of 58-52, holding off a determined effort from CICS Longwood. Longwood led 5-4 three minutes in, but Niles West erupted for nine straight points. Jaylen Miller scored twice during the run, and Emil Comor added a three from the corner. The Wolves led 15-7 after one, but Longwood’s Damari Fonza heated up to start the second. He connected on a pair of triples in the first few minutes to bring the Panthers back even at 15-15. However, Niles West had another run in them before the half. Kevin Guillaume’s three triggered a 12-3 run that resulted in the Wolves leading 29-21 at the break. The Wolves enjoyed a significant shooting advantage in the half, hitting 52 percent on 11-21 while the Panthers were just 27 percent on 8-30. Niles West maintained its lead through the second half, fending off persistent challenges from Longwood. Nurell Lacey ignited the Panthers with 12 second-half points on four threes while Patrick Ben scored 11 of his team-leading 16 points after halftime. Ben’s final three points came with 30 seconds left and brought Longwood within four, but Richie Noparstak’s two free throws were enough to hold off the Panthers. Noparstak’s free-throw shooting was clutch in the second half as he went 6-6 at the line. Niles West (6-9) was led by Noparstak with 19 points and six assists, while Comor scored 17 (12 in the second half) on 6-9 shooting (3-4 threes). Along with Ben’s 16 points, Longwood (6-10) was paced by Lacey and Fonza with 12 each. 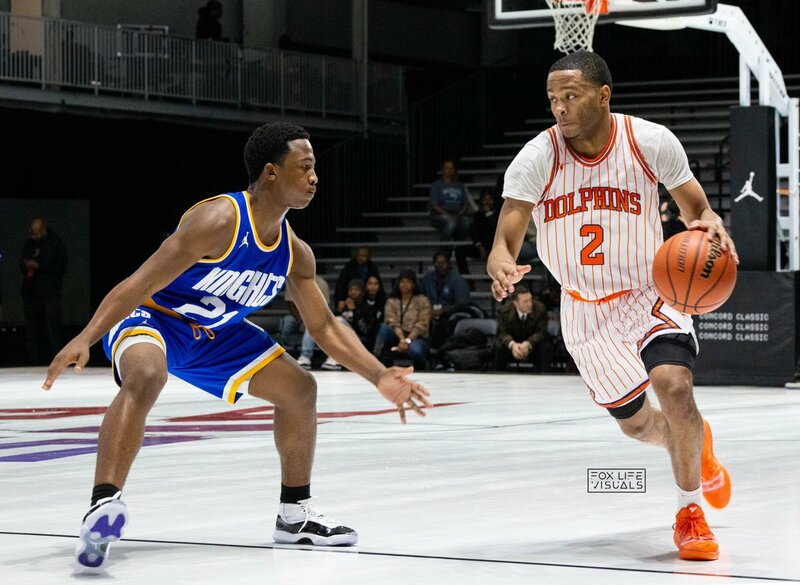 (Box Score) The second of two championship semifinals at the 58th annual Proviso West Holiday Tournament came down to the Whitney Young Dolphins against the Fenwick Friars. Both teams have enjoyed a good recent history in the tournament, with Whitney Young winning it all in 2016 and finishing second last year. Fenwick was runner-up in 2015, and finished fourth and fifth in each of the last two years. A very spirited and competitive game was not decided until the final seconds, but Whitney Young emerged the victor by a final score of 78-70. Leading 6-4, the Dolphins ran off eight straight points to seemingly take control. However, the Friars battled back, with a thunderous slam by Bryce Hopkins providing one of the loudest roars from the crowd this week. Solomon Oraegbu’s layup brought Fenwick to within 19-17, but Steward beat the buzzer with a long three to end the quarter at Whitney Young 22, Fenwick 17. The second quarter saw Whitney Young look to pull away again as Myles Baker drained three triples in a 90-second span to put the Dolphins up 10. However, Fenwick refused to go away, despite Whitney Young’s shot-blocking ability making the going rough inside, and a buzzer-beating three by Hopkins made it only a six-point game at the break, 40-34. A couple of timely threes contributed to the next Dolphins’ surge. After Fenwick’s Trey Pettigrew hit a three to make it a four-point game midway through the third, Steward followed a Tyler Beard layup with a pair of treys, completing an 8-0 run and forcing a Friars’ timeout. This time, there was no immediate response from Fenwick, and Whitney Young went to the fourth leading 60-48. The Dolphins looked to pull away one more time as they took their largest lead of the game at 17 with six minutes remaining. But the Friars made one more effort, closing to six points on Hopkins’ three with 52 seconds left. They got the ball back with a chance to make it a one-score game, but Oraegbu’s three was slightly off and wedged between the glass and the rim. The possession arrow was in favor of Whitney Young, and they scored a final basket to close out a very competitive semifinal game. Whitney Young (11-4) shot a fine 56 percent for the game on 32 of 57 (8-17 on threes). Steward led all scorers with 30 points on 11-17 shooting (4-8 threes). Baker finished with 14 points (4-8 threes), and Keenan Jones and Sangolay Njie had 13 each; Njie also recorded five blocks. Fenwick (8-5) was led by Hopkins’ 23 points (10-27 shooting) and Oraegbu’s 20 (9-16 shooting), while Pettigrew hit three of five triples as part of an 11-point performance. The stage is now set as Whitney Young will look to make it two PWHT titles in three years when they play Bogan on Saturday night at 7 p.m. Fenwick and Leo will play for third place at 5:30 p.m.
(Box Score) The first of two championship semifinals at the 58th annual Proviso West Holiday Tournament paired the Bogan Bengals against the Leo Lions. Going into the game, basketball observers were likely excited for the prospect of a battle of big men, but it was 5’ 9” guard Jordan Booker that was the standout, leading Bogan to a 60-54 win. In the first quarter, the prominent big man on the floor was Leo’s Kendale Anderson. The 6’ 6” junior scored six points on 3-4 shooting while pulling down six rebounds and blocking a shot. Kendale’s brother, 6’ 7” Dechaun Anderson, and Bogan’s 6’ 8” Rashaun Agee both had shooting difficulties in the quarter, but the Bengals trailed by just 15-14 after eight minutes. The focus for each team remained inside during the second quarter, but Leo was more successful at drawing fouls on their drives to the basket. The Lions shot 16 free throws in the quarter, making 10 of them, while the Bengals shot just two free throws in the final minute. Neither team could shoot significantly well from the field, and the half ended with Leo holding a slim 29-27 lead. The third quarter began with eight straight points from Bogan, including threes by Kyndall Davis and Jeremiah Washington. Leo answered with a three by Fred Cleveland, but Bogan came back with a 6-0 run as Agee threw down a slam and Jordan Booker scored twice inside. Booker remained on fire for the rest of the quarter, shooting 5-6 for 11 points and boosting Bogan’s advantage to 50-36. Bogan looked to be in command with five minutes left and a 54-41 lead before hitting a scoreless spell of four minutes. Leo made up nine points before Booker set up Agee for a thunderous slam at the 1:06 mark. Two free throws by Jayvon Clark pushed the lead to eight, and Bogan was able to hold off Leo and set up their first trip to the PWHT title game. Booker led Bogan (12-1) with 23 points on the strength of 11-16 shooting. Agee was held to 13 points (6-15 shooting) but pulled down 21 boards as Bogan finished with a 48-31 margin in rebounds. Davis also scored 13, shooting 5-7 from the field. Leo (11-3) was led by D. Anderson’s double-double of 18 points and 15 rebounds. Cleveland added 15 points despite being held to 4-16 shooting, and K. Anderson finished with 10 points and six boards. Bogan will meet the winner of Whitney Young and Fenwick in the championship game Saturday at 7 p.m. Leo will play the preceding game for third place at 5:30 p.m.
(Box Score) Game four on Friday’s schedule for the 58th annual Proviso West Holiday Tournament paired the Hillcrest Hawks against the Morton Mustangs, with the winner advancing to Saturday’s fifth-place game. This game showed some brilliant performances on both sides, but it was Morton that recovered from a quick-strike Hillcrest comeback in the third quarter to down the Hawks by a 77-73 final. Trailing 20-15 after one quarter, Morton played a solid second quarter in working their way to a 40-33 lead at the half. Latik Murphy was the undisputed top gun for the Mustangs, shooting a torrid 6-8 from beyond the arc and scoring 23 points, including a rare four-point play just before the halftime buzzer. Led by his example, Morton shot 9-13 on threes for the half and 14-27 (52 percent) overall. Hillcrest shot just 14-37 (38 percent) overall and 3-16 from threes, but they committed just three turnovers while forcing Morton into 11, resulting in 13 points for the Hawks. The Mustangs looked to run away and hide when Murphy’s two free throws with 2:42 remaining in the third gave Morton a 55-40 lead. The game suddenly changed gears at that point as the Hawks ran off 15 straight points to end the quarter. Mar’Keise Irving hit a three during the run, and Julius Rollins scored three times, the last coming on a putback with nine seconds left that sent the game into the fourth quarter at 55-55. As with the earlier games today, this one came down to the final minutes. Morton’s Manny Rodriguez hit a three at the 2:20 mark to give the Mustangs the lead 70-67. A layup and then 1-2 free throws by Jamajae Garner made it a six-point game before Jeremiah Staten cut that in half with a three. The Hawks had a chance to tie, but a turnover cost them the opportunity, and two free throws by Rodriguez with 9.4 seconds left proved to be the winning points when Kenton Wright hit a long three with 0.9 seconds to go. Rodriguez provided the final insurance with 0.6 seconds left with two more free throws. Murphy led all scorers with 30 points on 9-19 shooting (6-9 threes) and 6-7 at the charity stripe. Rodriguez, who hit four clutch free throws in the final 10 seconds, shot 5-7 from three-point range and finished with 19 points. Garner added a double-double of 14 points and 11 rebounds. Hillcrest (8-6) had five players finish in double figures, led by Rollins with 15 points (7-11 shooting) and 11 rebounds. Irving (4-9 on threes) and Wright each scored 14, and Staten and Anthony Harris each tallied 11 points. Morton (9-4) will play the fifth-place game of the tournament on Saturday at 4 p.m. against Proviso East. (Box Score) Friday’s third game at the 58th annual Proviso West Holiday Tournament saw two teams looking to move on after losing tough games on Thursday. The Proviso East Pirates and the Uplift Titans battled intensely for four quarters before Proviso East prevailed by a score of 73-69. The first half saw Markese Jacobs and Aaron Sykes lead their respective teams through an exciting 16 minutes. Both players scored 15 points, Sykes on 6-8 shooting and Jacobs 6-9 shooting. Sykes also pulled down seven rebounds as his Proviso East team collected 16 rebounds to Uplift’s 12. The Titans had the edge in first-half shooting, 48 percent (13-27) to the Pirates’ 42 percent (11-26), but when the dust had cleared, the two sides went into the halftime break tied at 32-32. The game remained close in the third quarter, although several of Sykes’ teammates provided the scoring as Sykes himself was held scoreless. On the other side, Jacobs had a monster of a quarter, scoring 14 points with four baskets (including a three) and 5-5 on free throws. Three of the free throws came at the buzzer as Jacobs was fouled on a shot just inside halfcourt, He made good on all three to give Uplift a 50-48 lead heading into the final eight minutes. A three by the Pirates’ Robert Johnson started the action in the fourth quarter. The game went back and forth before James Hobson hit a three to propel Proviso East into the lead for good at the 4:28 mark. The Pirates held on to win through solid free-throw shooting (21-25, including 9-11 in the fourth) and control of the boards (38-26). Sykes led four Proviso East (8-3) players in double figures with 16 points and added a game-high 11 rebounds, two assists and three steals. Terrance Thomas scored 15 (5-7 shooting), Hobson tallied 14, and Devin Spencer played a great all-around game with 10 points, eight assists and six steals. For Uplift (8-4), Jacobs recorded a game-high of 37 points on 12-20 shooting (3-8 threes) and 10-11 on free throws. DeAndre Vortes was the only other Uplift player in double figure with 10 points (4-6 shooting). Proviso East will meet the winner of the Hillcrest-Morton game in the fifth-place game on Saturday at 4 p.m.
(Box Score) Dunbar and St, Joseph took to the floor in the 58th annual Proviso West Holiday Tournament, looking to secure a spot in Saturday’s consolation championship game. The battle for that spot produced one of the closest games thus far in the tournament, with St. Joseph surviving a frantic finish to edge Dunbar 50-48. The three-point shooting of St. Joseph got them off to a quick start. Reggie Strong, Maliq Anderson and Jon Robinson all hit their initial shots from outside to put the Chargers up 9-3. St. Joseph maintained the lead through the rest of the quarter, with Strong’s off-balance jumper beating the buzzer to give the Chargers a 21-11 lead. St. Joseph shot 8-14 from the field while Dunbar was just 4-10. The roles were reversed in the second quarter as Dunbar heated up while St. Joseph cooled off. Ishmael Martin hit from downtown, and Laron Owens was good on two triples, his second one tying the game with 1:29 remaining. However, Brandon Malone hit on a three in the final seconds of the half to regain the lead for St. Joseph at 30-27. Dunbar came out mighty to start the third quarter, scoring the first 11 points. Tyrese Spurlock’s tip-in gave Dunbar the lead, and Terrance Marshall later converted on a three-point play. However, St, Joseph charged back to score the next eight points, Malone’s long two knotting the game at 38-38. The Mighty Men then took the lead back just before the quarter ended on Gavin Alston’s tip-in. A 7-0 run in the fourth quarter put St, Joseph on solid ground. Malone’s two free throws gave the Chargers a 44-43 lead. Anderson followed with a three, and Robinson finished a fast break following a steal to make it a six-point game with 4:26 remaining. However, Owens hit two free throws, and Alston nailed a left-corner three to bring Dunbar within one with a minute left. Robinson split two free throws with 24 seconds left before the Chargers survived a hair-raising finish. Spurlock had three shots at the basket, missing the first two before being fouled on the third with 5.6 seconds left. He missed both free throws, but Dunbar rebounded. Alston and Martin had final chances to tie the game, but their shots both rimmed out as the horn sounded. Anderson led St. Joseph (6-7) with 14 points on 6-10 shooting (2-3 threes), while Robinson added 10 points and eight assists. Martin topped Dunbar (12-3) with 16 points, and Alston had 10 points and nine rebounds. St. Joseph and Larkin will meet in the consolation championship game on Saturday at 2 p.m.
(Box Score) Day three of the 58th annual Proviso West Holiday Tournament opened with Hyde Park Academy and Larkin High School battling to earn a spot in Saturday’s consolation championship game. A hard-fought game was decided in the final minute, with Larkin squeezing out a 39-35 victory over Hyde Park. The second quarter saw the Thunderbirds continue to be frustrated on offense. After hitting just one field goal in the first quarter, Hyde Park went the first 6:30 of the second without one before Jaquan Reed made good on a three from the left wing. The Thunderbirds made just three of 20 shots in the first half (all three from three-point range) but managed to stay within three points at the half, 18-15. In the third, Hyde Park began to pick up the offense and came back to tie the score on two occasions. However, with the score at 21-21, Larkin ran off six straight points, capped off by a steal and breakaway layup by Marcus Green. But Hyde Park recovered from that setback and outscored Larkin 8-3 over the final minutes, with Terrence Boykin’s three tying the score 29-29. The game came down to the final minutes after Christopher Rose had given Hyde Park a 35-34 lead with 3:52 left. That score held until 44 seconds left when Wheeler-Thomas scored in the lane to put the Royals back on top. Following a charge, Jashon Johnson-Neals was fouled and split a pair of free throws for a two-point lead. Hyde Park went for the lead, but Reed missed a three. Johnson-Neals rebounded, was fouled and sank two free throws with 7.2 left for the final four-point margin. Wheeler-Thomas led Larkin (6-10) with 12 points, three assists and three steals. Johnson-Neals added nine points and pulled down eight rebounds. Reed topped Hyde Park (5-6) with 12 points and added five rebounds and five steals. Larkin will advance to play the winner of Dunbar and St. Joseph in the consolation championship game on Saturday at 2 p.m.
(Box Score) The final spot in the “final four” for the 58th annual Proviso West Holiday Tournament was at stake in Thursday’s final game as the Morton Mustangs met the Whitney Young Dolphins. The Dolphins had some history on their side, having won the 2016 PWHT and finishing as the runner-up in 2017. They are now one win away from a return to the championship game after taming the Mustangs by a final score of 80-43. The Dolphins led 8-6 midway through the opening quarter when Myles Baker’s three triggered a 10-2 run. D.J. Steward also contributed a three as Whitney Young built a 10-point lead after one. Morton broke from the gates in the second quarter with a 7-2 run, helped along by a Manny Rodriguez three. But just as quickly as the Mustangs gained momentum, the Dolphins took it back. Whitney Young scored the next 15 points, capped by a Baker three, and the Dolphins stayed on a roll through the end of the half, taking a 45-19 lead into the break. Morton played its best offensive quarter in the third with 17 points, but Whitney Young was able to match the pace. The Dolphins increased the lead to 29 points by the end of the quarter, and the fourth quarter saw extensive playing time for many of the reserves. Whitney Young (10-4) shot 62 percent for the game on 32-52, while Morton (8-4) was just 31 percent on 18 of 58. Steward led the Dolphins with 22 points, Baker had 17 points on 7-8 shooting, while Justin Warren added 10 points and six assists. Latik Murphy led the Mustangs with 17 points while Jamajae Garner had 14 points and nine rebounds. Fenwick (9-4) will advance to play the winner of Whitney Young and Morton on Friday at 7 p.m. Hillcrest (8-6) will take on the loser of that game Friday at 4 p.m.
(Box Score) Thursday’s winners’ bracket play of the 58th annual Proviso West Holiday Tournament continued with a match between Fenwick and Hillcrest. Both teams were coming off impressive wins on Wednesday, but for the second night in a row, it was Fenwick that took care of business late as they held off Hillcrest by a final of 73-64. The game began on a fast clip as Hillcrest’s Mar’Keise Irving scored 10 first-quarter points. Fenwick was able to keep up in the first, trailing just 20-16, but Hillcrest stepped it up further in the second quarter by shooting 9-12. The combination of Irving and Jeremiah Staten was lethal, as Irving scored 20 for the half (8-13 shooting) while Staten handed out nine of the Hawks’ 13 assists. Bryce Hopkins and Solomon Oraegbu kept Fenwick in the hunt as they combined for 24 points, but Hillcrest scored 28 points in the paint as they grabbed a 40-29 lead at the half. Fenwick caught fire to start the second half, going on an 11-3 run over the first three minutes. The Friars stayed close and finally caught the Hawks 47-47 at the 2:30 mark as Oraegbu stole the ball and went in for a slam. Less than a minute later, Trey Pettigrew canned a three, his first points of the game, as Fenwick took the lead for the first time since the first quarter. Lucas Kolovitz added a three, and the Friars went to the fourth quarter, leading 53-49. Hillcrest caught Fenwick with the first four points of the fourth, but the Friars regained the lead with a layup by Oraegbu and a three by Pettigrew. It became a 9-0 run before Irving halted it with a three at the 2:26 mark. The Hawks got as close as four points with 1:14 left, but the Friars were able to seal the deal at the free-throw line. Oraegbu led Fenwick with 25 points (9-14 shooting) and also chipped in with four assists and five steals. Hopkins added 23 points, six rebounds, three assists and three steals, and Kolovitz had 10 points and a team-leading nine rebounds. For Hillcrest, Irving scored a game-high 35 points (13-24 shooting, 6-17 threes), and Dylan West added 13 points and seven boards. Staten finished with seven points and 12 assists. (Box Score) Bogan and Proviso East took the floor in the second game in Thursday’s winners’ bracket of the 58th annual Proviso West Holiday Tournament. Bogan got off to a commanding start but had to weather a spirited comeback effort by Proviso East before pulling away down the stretch to win 75-58. Proviso East had a difficult time getting started, missing their first five shots and committing four turnovers before Aaron Sykes broke the ice with a layup at the 4:14 mark. By that time, Bogan had scored 12 points, including a pair of Tyreon Hardin threes and powerful slam dunks by Rashaun Agee and Kennedy Brown. The opening quarter ended with the Bengals leading the Pirates 18-4. The Pirates chipped away at the Bengals’ lead in the second, forcing some turnovers and holding Bogan to just nine shots in the quarter. However, Agee remained a hard man to contain, and he finished the half with 14 points (7-10 shooting), 10 rebounds and four blocks as Bogan maintained a 32-23 lead at the break. Both teams stepped up the pace of the game in the third, and the Pirates got the better end of the deal. Terrance Thomas went 4-4 from the field as Proviso East shot 10-16 in the quarter, and they made up four points with the score standing at Bengals 51, Pirates 46 entering the fourth. The Bengals wrapped up the game down the stretch with a 9-0 run, complete with a three by Jeremiah Washington and two inside scores by Agee, one of them another crowd-thrilling dunk. Agee enjoyed his second monster performance in as many nights, He scored 29 points (14-17 shooting), pulled down 16 rebounds and blocked five shots. He was joined in double figures by Hardin with 16 points (4-7 on threes). Jordan Booker also had a top game for Bogan, handing out 11 assists to go with eight points and three steals, James Hobson led the Pirates with 20 points and seven steals. Thomas added 14 points (6-8 shooting) and Devin Spencer 11 points. Bogan (11-1) will advance to face Leo on Friday at 5:30 p.m. Proviso East (7-3) will battle Uplift earlier in the day at 2 p.m.
(Box Score) The first game in Thursday’s winners’ bracket of the 58th annual Proviso West Holiday Tournament paired two teams off to strong starts this season, the Leo Lions and the Uplift Titans. But it was the strength of Leo’s inside game that ultimately decided this matchup, as the Lions powered their way to a 69-59 win. Leo jumped out to a fast 13-5 lead, with 11 points coming from the combination of yesterday’s two top scorers, Dechaun Anderson and Fred Cleveland. However, Uplift stormed back by scoring the final eight points of the quarter, with the help of threes by Detalian Brown and Michael Allen. In the third quarter, Leo’s height and strength began to take over inside. Between them, 6’ 7” Dechaun Anderson and 6’ 6” Kendale Anderson scored 18 points and pulled down 14 rebounds in the eight-minute period. The Lions were looking good at 46-33, but Uplift finished the quarter with a 9-0 run started by Greg Ruben’s three. Just like that, the Titans were back within four as the teams entered the final quarter. Having survived the third quarter, Uplift hoped to gain the upper hand in the fourth by taking advantage of Leo’s foul trouble. Cleveland fouled out with 6:10 left and, moments later, the Titans were within 49-47. Inexplicably, Uplift hit a wall at that point, missing its next eight shots and committing a couple of costly turnovers. Leo capitalized to the tune of 13 straight points and, with three minutes remaining, the Lions were able to close out a big second-round victory. Leo was led by D. Anderson’s 22 points and K. Anderson’s 19. Both players pulled down 19 rebounds as the Lions won the boards by a massive margin of 50-26. Cleveland added 10 points, three assists and four steals. Uplift (8-3) was paced by Jacobs with 24 points and Brown with 16. Leo will face the winner of the Proviso East-Bogan game on Friday at 5:30 p.m. Uplift will take on the loser of that game earlier in the day at 2:30 p.m.
(Box Score) The final consolation bracket game on day two of the 58th annual Proviso West Holiday Tournament matched the Chargers of St. Joseph versus the Warriors of Crete-Monee. St. Joseph broke open a close game at the half with a strong, balanced team effort in the third, leading the way to a 67-52 victory. The first half was played on fairly even terms, although St. Joseph led for 13 of the 16 minutes. Shooting percentages, rebounds and turnovers were all virtually even, with St. Joseph leading at the half by a single point, 24-23. St. Joseph took the upper hand to start the third quarter, scoring the first nine points. Four players scored during the run, with Jon Robinson connecting on a three-pointer. The Warriors battled back to within five points before the Chargers ran off another 9-0 burst. Kyle Thomas scored twice inside, and Robinson capped things off with another three for a 42-28 lead. Leading by 11 going into the fourth quarter, Robinson hit his third trifecta of the game, and Maliq Anderson scored for a 16-point lead. That would provide an ample enough cushion for the Chargers, as the Warriors got no closer than 12 points with a minute remaining. St. Joseph ensured their win by shooting 68 percent (19-28) in the second half. The stat sheet showed a nice scoring balance for the Chargers, led by Robinson with 15 points. Thomas scored 14, while Reggie Strong and Brandon Malone added 12 each. Julian Dancy led the Warriors with 17 points, followed by Karriem Hamilton Jr. with 13 and Coy Hampton with 10. St. Joseph (4-3) will advance to play Dunbar on Friday at 12:30 p.m. in the consolation bracket. Crete-Monee (1-11) will take on host Proviso West on Saturday at 12:30 p.m.
(Box Score) Coming off a tough overtime loss on Wednesday, the Mighty Men of Dunbar High School faced another stiff challenge today. Dunbar was paired against the host school at the 58th annual Proviso West Holiday Tournament. The game was close for the first half, but a 22-0 third quarter shifted the game permanently toward Dunbar, and they won going away by a final of 64-42. The two sides battled through a fast-paced first half. The Dunbar tandem of Tyrese Spurlock and Gavin Alston kept the Mighty Men’s offense rolling, combining for 10-14 shooting (3-4 threes) and 26 points. But Austin Murray kept Proviso West in the chase, hitting his first five shots (including a three) and leading all scorers with 14 points. After 16 minutes, Dunbar held a 35-27 lead. The third quarter was all Dunbar. The Mighty Men pitched a shutout over the entire eight minutes, holding the Panthers to 0-14 shooting and forcing six turnovers. Meanwhile, Dunbar erupted for 22 points for a 57-27 advantage. Ishmael Martin, held scoreless in the first half, led the Mighty Men in the quarter with seven points. The fourth quarter was mostly in the hands of both teams’ reserves. Proviso West ended its dry spell of over 12 minutes without a field goal when Murray drained a three at the 5:11 mark. For Dunbar (12-2), Alston led the way with 21 points, eight rebounds, two blocks and three steals. Spurlock finished with 15 points (7-9 shooting), and Martin added 13. Proviso West (3-6) was led by Murray’s game-high 25 points (10-16 shooting, 5-6 on threes). Dunbar will play on Friday at 12:30 p.m. in the consolation bracket. Proviso West will host a 12:30 p.m. game on Saturday. (Box Score) Day two of the 58th annual Proviso West Holiday Tournament pitted the Thunderbirds of Hyde Park Academy against the Wolves of Niles West High School. It was a game of two halves, with Niles West controlling the first half and Hyde Park overcoming a 10-point deficit in the second half to win by a final score of 63-57. Both teams struggled with their shooting for the majority of the first half. Niles West had a 21-12 advantage on the boards but could not capitalize on their extra opportunities. Finally, trailing 15-11, the Wolves went on a 10-0 run, with three of their baskets coming on the fast break. Late threes by Kevin Guillaume and Richie Noparstak capped off an 18-4 run during the second quarter, extending the lead to 29-19 at halftime. The Thunderbirds fought back behind a nine-point third quarter by Jalen Houston and cut the deficit to 44-39 entering the final eight minutes. The momentum swing continued into the fourth, as the Thunderbirds began with an 8-0 burst, with Houston hitting a pair of bookend threes. The Wolves interrupted the run with a basket by Haris Mackic, but they would never regain the lead. Hyde Park (5-5) scored the next seven points, and they were able to command the game down the stretch and hold off a final push by Niles West to take the victory. Houston scored 18 of his game-high 29 points in the second half, shooting 10-18 from the field and 6-8 on free throws. Michael Brown scored 10 and added two assists and four steals. For Niles West (5-9), they were led by Guillaume with 20 points and Noparstak with 16. Hyde Park advances in the consolation bracket to play Larkin on Friday morning at 11 a.m. Niles West will play on Saturday morning at 11 a.m. versus Longwood. (Box Score) Day two of the 58th annual Proviso West Holiday Tournament began with play in the consolation bracket and a contest between Larkin High School from Elgin and CICS Longwood from Chicago. It was a game of runs, but Larkin was able to withstand all of Longwood’s challenges, prevailing by a final score of 71-58. Larkin led by six points at the half but scored the first seven points of the third quarter, capped off by a three from Trace Boley. The Royals remained on a run, stretching their lead to 16 on another triple by Perez Jr. However, the Panthers closed to within 10 at the end of the third and then narrowed the gap to three on a three-point play by Marshawn Holliday with 4:41 left. That was as close as Longwood would get, however, as Larkin made its shots down the stretch to hold off the final challenge. Four players scored in double figures for Larkin (5-10), who shot 54 percent from the field on 28-52. Perez Jr. led the way with 17 points, including a perfect 4-4 on threes. Jashon Johnson-Neals scored 16 (7-9 shooting), followed by Damari Wheeler-Thomas with 12 and Fernando Perez with 10. Longwood (6-9) was led by Lacey, who shot 5-9 on threes as part of a 19-point performance. Larkin will advance to the next round of consolation bracket play with a game on Friday morning at 11 a.m. Longwood will play a final game on Saturday at 11 a.m.
(Box Score) The Morton Mustangs opened their 2018 Proviso West Holiday Tournament with a hard fought 54-51 victory over the St. Joseph Chargers in game eight of day one of the tournament. The Mustangs (8-3) move on the championship quarterfinal against Whitney Young tomorrow night at 8:30pm. The Chargers (3-3) will play in the consolation quarterfinal tomorrow against Crete Monee at 2:00pm. In the first half, Morton jumped out to a 14-6 lead after the first eight minutes behind ten first quarter points from Latik Murphy. St. Joseph answered by closing the second quarter on a 10-3 run to pull back within 19-18 after the first half of play. The third quarter saw both teams get things going offensively. The two sides traded the lead multiple times over the eight minutes, but Morton was able to close on a 7-0 run to take a 40-35 lead after three quarters of play. The two teams battled tough in the fourth quarter, but Morton was able to hang on for the 54-51 win despite a late charge by the Chargers. Reggie Strong led St. Joseph with 16 points on the night, followed by Markus Becton with 12. As a team the Chargers shot 38.9 percent from the floor. Murphy led the Mustangs with 27 points on the night. Jeremiah Davis led the team with 11 rebounds. As a team Morton shot 41.2 percent from the floor. (Box Score) Whitney Young cruised to a 78-45 win over Crete Monee in game seven of the Proviso West Holiday Tournament. The Dolphins (9-4) advance to take on the winner of the St. Joseph/Morton matchup at 8:30 p.m. Thursday. The Warriors (1-10) will take on the loser of the St. Joseph/Morton matchup at 2:00 p.m. Thursday. Whitney Young led 26-4 at the end of the first quarter and 44-16 at halftime. The Dolphins collected 18 steals and scored 32 points off those miscues. DJ Steward (15 points), Tyler Beard (12 points), Myles Baker (12 points and Robert Bostma (10 points) were in double-figures for Whitney Young. Steward picked up four of the Dolphins' 17 steals. Karriem Hamilton led the Warriors with a game-high 19 points and eight rebounds. Julian Dancy added 14 points (four three-pointers), five assists and two steals. (Box Score)The Hillcrest Hawks opened their 2018 Proviso West Holiday Tournament experience with a 73-46 win over the host Proviso West Panthers in game six of day one of the tournament. With the win, the Hawks improve to 8-4 on the season and advance into the winner’s bracket where they will meet Fenwick on Thursday night at 7:00 p.m. The Panthers fall to 3-5 on the season and will meet Dunbar at 12:30 p.m. in the consolation bracket. Proviso West outscored the Hawks 20-19 in the first quarter before Hillcrest settled in and doubled up the Panthers 20-10 in the second. Leading 39-30 at the half, the Hawks came out of the break with a 6-0 run to push the lead up to 15 and force a Panthers’ timeout. Hillcrest continued to open things up throughout the quarter, outscoring the host Panthers 21-7 in the period to extend the lead to 60-37 after the third and never looked back. Mar’Keise Irving led the way for Hillcrest, dropping in 20 points to lead three in double-figures scoring. Julius Rollins added 18 and pulled down ten boards while Dylan West added 11 points and 12 rebounds. The Hawks shot 48-percent from the field (30-for-62), including five of 13 from three. For Proviso West, Austin Murray scored a team-high 13 points and grabbed seven rebounds while Calvin Lucas added ten points. The Panthers shot 18-for-49 from the field, hitting on seven of 18 attempts from three-point distance. 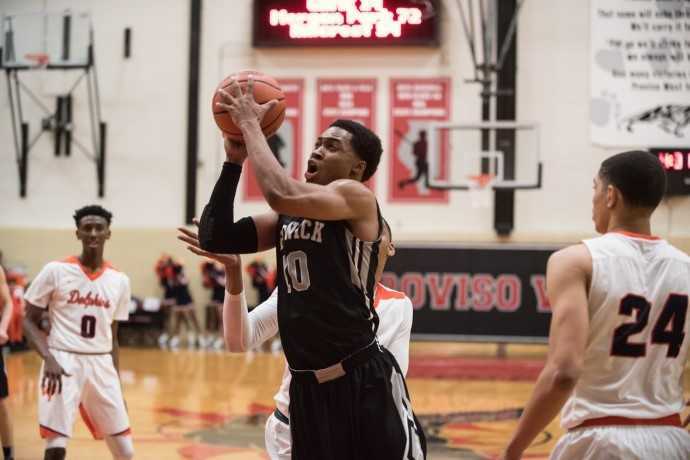 (Box Score) The Fenwick Friars and Dunbar Mighty Men faced off this evening in game four of the first round of the 58th annual Proviso West Holiday Tournament. Bryce Hopkins was the difference maker for the Friars, as his 36 points and 10 rebounds led Fenwick to an 84 to 75 overtime victory over Dunbar. A balanced attack helped Dunbar to grab an early lead that they were able to build to 17-10 after one quarter of play. In total five different players scored in the quarter. Dunbar continued to add on early in the second quarter, using a three by Ishmael Martin to build the lead to double digits. Fenwick was able to battle back by controlling the boards by a 23-11 margin in the half. Fenwick pulled back within 34-29 at the half by closing on a 7-2 run. In the third quarter, Dunbar was able to ride the hot hand of Martin to a 10-2 run through the middle part of the quarter to build their lead back to double digits. A buzzer beating three from Bryce Hopkins pulled Fenwick back within 56-46 after three quarters of play. Fenwick battled back in an exciting fourth quarter, getting as close as one on a Solomon Oraegbu three. The Friars were able to complete the comeback with just ten seconds remaining in the fourth quarter on two Trey Pettigrew free throws. Fenwick was able to stop a last second heave from Dunbar to force overtime. In the overtime period, Fenwick was able to break off an 11-2 run to open the extra period. They were able to hang on from there for the 84-75 victory. Fenwick shot 43.1 percent on the night, including 22-32 from the charity stripe. Hopkins led with 36 points, followed by Oraegbu with 20 and Trey Pettigrew with 12. Dunbar shot 46.3 percent on the night including 12-21 from three. Martin led the team with 39 points on the night. Fenwick (7-4) advances to the championship bracket quarterfinal tomorrow evening at 7:00pm. Dunbar (11-2) will play in the consolation quarterfinal tomorrow afternoon at 12:30pm. (Box Score) The morning session for day one of the 58th annual Proviso West Holiday Tournament concluded with action between Bogan High School of Chicago and Niles West High School of Skokie. Bogan, fifth-place finishers at last year’s tournament, dominated in most aspects of the game and improved to 10-1 on the season, pulling away to a 65-32 victory. Bogan took a 13-10 lead after one quarter and maintained the lead through the second, although Niles West stayed close throughout. The Wolves were within five points with 2:25 remaining, but the Bengals scored the final five points of the half, with Jordan Booker hitting a running one-hander to beat the buzzer and give Bogan a 28-18 lead at the break. The Bengals broke open the game in the third with a 20-4 run. Bogan was able to score on a couple of fast breaks and created some other close-in chances. Niles West attempted a comeback with an 8-0 run over the end of the third quarter and beginning of the fourth, but Bogan turned on the jets again. Rashaun Agee’s long two gave the Bengals their first 30-point lead, and his thunderous slam next time down the floor had the game totally in Bogan’s control. Agee put on a showcase for the Bengals, shooting 11-16 on his way to a game-high 24 points. The 6’ 8” senior posted a double-double with his 13 rebounds, and he completed a strong stat line with three assists, three steals and a block. The Bengals, who shot 52 percent for the game (29-56) also had Booker in double figures with 10 points (5-8 shooting). Niles West (5-8) was led by Richie Noparstak with 12 points. Bogan will take on Proviso East I a winners’ bracket game on Thursday at 5:30 p.m. Niles West will tangle with Hyde Park Academy on Thursday at 11 a.m.
(Box Score) The Proviso East Pirates and Hyde Park Academy Thunderbirds squared off in game three of Wednesday’s first round of the 58th annual Proviso West Holiday Tournament. This game was decided on the inside as Proviso East controlled the boards and pulled away to a final score of 77-51. James Hobson had the hot hand early for the Pirates. He hit a pair of shots from the outside, his second three giving Proviso East a 13-3 lead midway through the first quarter. Leading 19-9 after one, the Pirates’ edge remained in the 9-12 point range until the final 10 seconds of the first half when the Pirates put up five quick points to take a 41-26 lead at the half. The Pirates built their lead to 19 in the third quarter before the Thunderbirds scored seven straight points to cut the margin to 50-38. However, Aaron Sykes scored twice inside to halt Hyde Park’s momentum, and Proviso East took the lead back up to 18 points after three. The Pirates then scored the first six points of the fourth quarter and kept their lead above 20 for the remainder of the game. Led by Sykes’ 11 rebounds, Proviso East pulled down 57 to Hyde Park’s 40 (Braijon Johnson, 13). The interior play of both teams was strong as they combined for 18 blocked shots; Timayron Shorts was credited with four of the Pirates’ eight rejections, while four Hyde Park players had two blocks each among 10 total for the Thunderbirds. Scoring leaders included, for Proviso East, Hobson with 20 and Sykes with 19, while Johnson had 20 and Jalen Houston 14 for Hyde Park. Proviso East (7-2) advances to the winners’ bracket and will play a 5:30 p.m. game on Thursday. Hyde Park (4-5) will play on Thursday at 11 a.m.
Uplift led 17-11 after one quarter but opened up a huge lead with a 23-6 second quarter. The Titans shot 9-19 in the quarter while holding the Royals to just 3-11, including no field goals in the final 3:44. 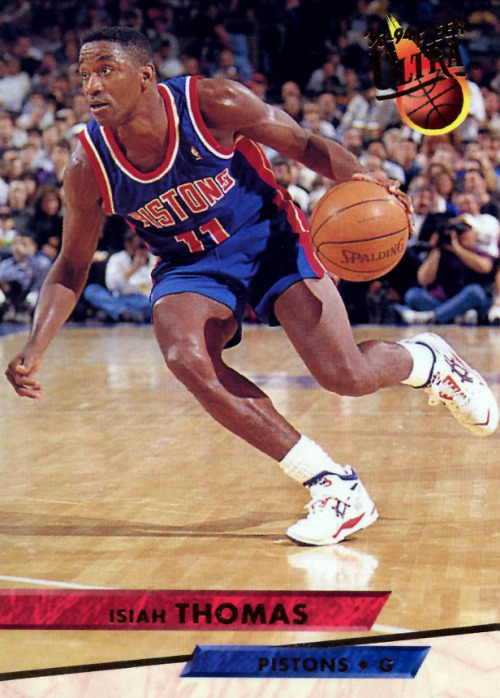 Uplift was also able to capitalize on 15 Larkin turnovers in the half, while they were guilty of just five themselves. Two-time PWHT all-tournament tem member Markese Jacobs was in the spotlight again today for Uplift. Despite not being in the starting lineup today, Jacobs led all scorers with 36 points on 14 of 23 from the field, 5-9 from three-point range. The senior guard completed a great all-around day with five rebounds, five assists and four steals. Also in double figures for Uplift (8-2) were Detalian Brown with 15 points and Tavion Underwood with 13. Jashon Johnson-Neals paced Larkin (4-10) with 17 points, 7-9 shooting from the floor. Uplift will advance to play Leo in a winners' bracket game at 4 p.m. on Thursday. Larkin will battle CICS Longwood on Thursday at 9:30 a.m.
(Box Score)The one-two punch of Dechaun Anderson and Fred Cleveland hit early and often Wednesday for Leo High School, The Lions (10-2), one of the early favorites at the Proviso West Holiday Tournament, took command early in the game and never looked back, as they thumped CICS Longwood 83-50 in the tournament opener. Anderson, a 6'7" forward, put up a quick dozen as the Lions grabbed a 17-4 lead after four minutes. Cleveland, a 5'10" guard, followed with a three from the left corner and then a layup as Leo carried on to a 30-6 lead after one quarter. The pair stayed on a roll in the second quarter, combining for 41 points in the first half as Leo extended the lead to 53-21. The first-half stats showed Leo shooting .645 on 20-31, many of their shots coming in transition. Longwood was held to a .300 percentage on 9-30 from the field. The second half saw both coaches fully utilize their benches. Anderson and Cleveland would finish as co-scoring leaders for Leo, each scoring 23. Myles Thomas joined them in double figures, scoring 17 points. For Longwood, Damari Fonza scored a game-high 26 points, hitting on 11 of 20 from the field. Leo will advance to a winners' bracket game at 4:30 p.m. on Thursday. Longwood will begin the day's action on Thursday with a game at 9:30 a.m.
Coach Arthur “Goodie” Goodwin has built a team that Has been ranked number 2 in the top 25 based on the Quick start they’ve had and the talent he has on hand. 6’7” Rashaun Agee does work down low and can also step out and make the midrange shots. Jordan Booker is a lock down defender who also makes the offense click. Fred Cleveland Jr. is the leader of this team, but brothers, 6’8” Dachaun and Kendale Anderson Bring a great deal to the table. Proviso West will be the true test for the Lions and new coach Jamal Thompson who are one of the favorites to win the 2A title. They may face Uplift (also a 2A favorite) here at West. What a matchup that would be with Cleveland going against Markese Jacobs, “The Show” who has put up extremely big numbers this year. Don Houston has built a program that is respected throughout the state. His team is a mainstay in the South Suburban SICA Conference and has won the title numerous times. This tournament is part of the preparation for state and a possible trip to Peoria for the class 3A state title run. Dylan Woods is someone to watch. His numbers and leadership can make a difference. Pirates coach Donnie Boyce has been to the state Finals multiple times both as a player and as a coach. His experience speaks volumes and guarantees the pirates will be serious contenders in this tournament. Look for East to create a very fast paced game with their smothering run and jump defense. Gene Pingatore has been coaching St. Joseph high school basketball For over 40 years and he has more wins than anyone else in this tournament. Coach Ping is still going strong with a very competitive team. His team Received the 7 seed in this tournament and are very dangerous. At Proviso West you always find out what your team is made of. Don’t count St. Joes out. Anthony Longstreet, coach at Proviso West has had to pick up the Pieces this year and try to create a competitive team. The challenge is the Fact that he has no returning varsity players. Calvin Lucas, Demarius Horton and Austin Murray are being counted on to provide leadership this season. The Panthers presently stand at 1-2 and hope to break out with an upset or two at this tournament. led the number 1 ranked Dolphins in scoring this year. Way to prepare for state. Fenwick and new coach Staunton Peck are playing at a very high level despite losing two very good players from last year’s team. Sophomore Bryce Hopkins has stepped into the leadership role, and has provided a great deal of offensive punch for the team. He dropped in 31 points in a recent victory. He is the key to the team. Markese Jacobs has scored over 30 points several times, and even had 41 points in a game during this young season. This recent DePaul signee has truly matured according to head coach David Taylor. He is continuing to learn how to be a leader and make his teammates better, but when needed he can provide instant offense. The nickname “The Show” fits him because he is a human highlight when on the court. Expect Jacobs to provide great excitement during the Proviso West Holiday Tournament. PWHT Honors Kenny McReynolds with a service award.